What does a DecoXperience Business Opportunity Cost? 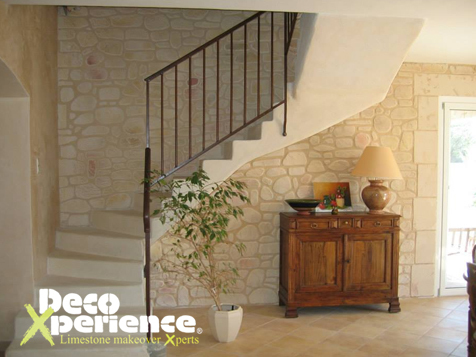 Decoxperience limestone makeover for walls has 15 years experience in both the US and Europe. Tap into the remodeling industry market as well as new construction market both residential and commercial. Over the years, hundreds of residential and commercial buildings have been transformed. You can count on our extensive Xperience to transfer our knowledge over to you to become successful. Imagine being able to create a stone surface of any type of rock appearance and shape without the cost and mess of truckloads of stone brought on site to be cut and constructed. 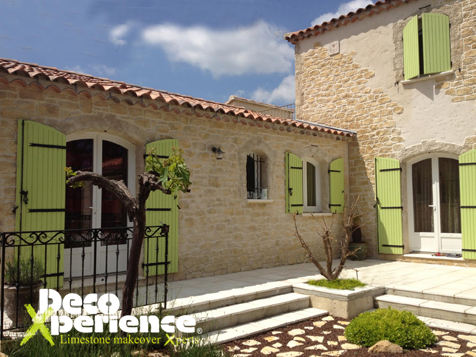 Decoxperience limestone coating has originated in the south of France in the late 1990's. 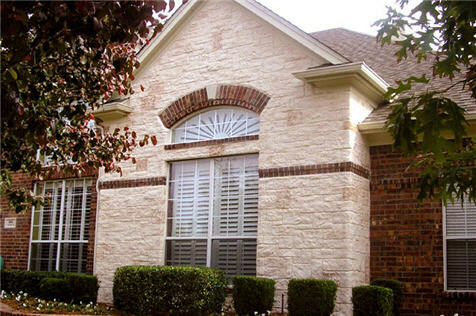 We have transformed our first house in the US in April 2005 in the Dallas-Fort Worth area. Since then we have improved numerous homes and commercial building. Most usual comment we receive: “it looks like stone”.....well because it is stone !! 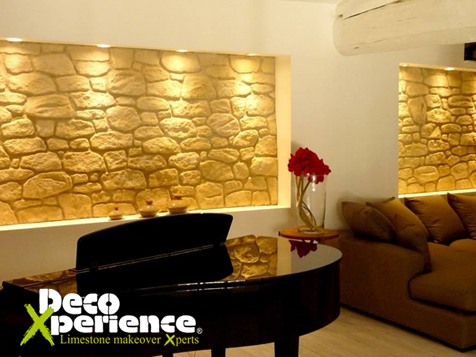 Decoxperience natural limestone wall makeover is a spray-on or troweled on limestone coating to be applied on walls whether it is a remodeling project covering old bricks or new construction. As we always say” if you have a wall, we can make it look like stone” even metal buildings. The product is natural and does not need special permits to be applied. You start with a ready mix bag, add water, apply the product on a wall as you have learned in training, use a stencil to outline the stone you want to design by applying natural oxides and pigments, carve the stones by following the lines, voila.. you have a stone wall. No franchise fees or royalty fees: you keep 100% of your profits from your work. We never charge fees or commissions. Our success is linked to yours. Protected territories: We believe you will be more successful when your market is not crowded by people doing the same thing you do. This is why we offer exclusive territories throughout the US and Canada at the distributorship level. Extensive training: whether you come from the construction industry or not, we have a mandatory training program included in our dealership package. This training is “hand-on”, on location at actual jobs, not in a warehouse making 1”x 1” panels. Equipment: Our process includes specific equipments needed to achieve efficiency. We have exclusive distribution of this equipment in the US and Canada. Sales and Marketing training: we provide a comprehensive “sales and marketing guide” along with a training to help you get your first job. We also have a picture book, custom printed sales aids, artwork for your business cards and more. We are looking for "The Working Investor" - hands-on business managers who work hard, desire more, and keep their eye on building wealth. You can come from many different backgrounds and careers. However, over time there are certain characteristics that we've found to be common factors contributing to the success of a Decoxperience distributor and / or dealer. Please contact us to see if the Decoxperience limestone system and you are right for each other. We are expanding in all states and international opportunities are available. Become a part of Team Decoxperience and Inquire Now! To take advantage of this unique opportunity, complete the form right now and we will get back to you within 24 hours.